DePace Lab is located on the 4th floor of the Harvard Medical School’s Warren Alpert Building at 200 Longwood Avenue in Boston, MA. The renovation project achieved LEED-CI certification at the Gold level in July, 2009. This was the first renovation of a wet lab at Harvard University to achieve a LEED certification, and shows the Medical Schools strong commitment to sustainability. 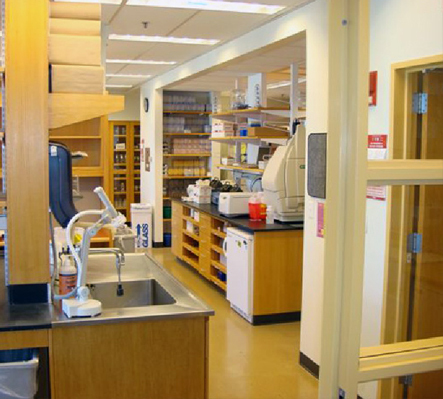 The 1,900 square foot renovation of the DePace Lab was completed in May, 2008 to meet the needs of Professor Angela DePace, whose group conducts research on genetics and evolution. A stated goal of the project was to provide a top quality lab facility while reusing the existing conditions as much as possible. This lead to the reuse of existing fume hoods, certain pieces of case work, and a carefully planned selective demolition of only some interior walls.